How long do reindeer live? 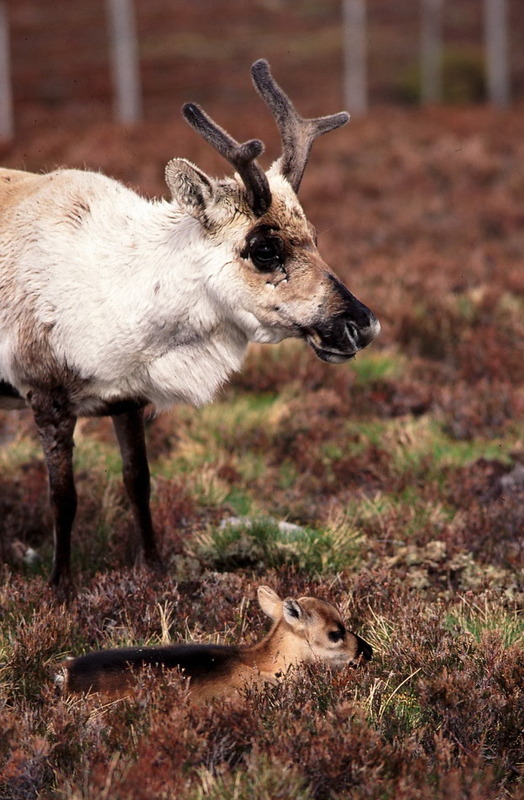 One of the most common questions I’ve been asked over the years is how long do reindeer live? I’ve always answered about 12-14 years on average, but a conversation with Dave earlier today in the office got me thinking about the topic. The course of a life. Female Ring, from tiny calf in 2002, to mature adult, to an old girl in her last months 15 years later. The askers of the question tend to be surprised by the answer, expecting the reindeer’s lifespan to be more in the region of a horse’s, say 25 to 30 years. But (very much as a generalisation) in the animal kingdom, the larger the animal the longer they tend to live, and reindeer are considerably smaller in body size than a horse, or indeed even a small pony, an adult weighing only between 100 – 150kg. Female reindeer in our herd tend to live a little longer on average than males, and looking at the herd list on the office wall here, currently indeed 9 out of the oldest 11 reindeer in the herd are female. In a totally wild situation this may be due to the stress the rutting season puts on a bull’s body each year, during which they can lose a third of their body weight, subsequently going into the hard winter months in much poorer body condition than the cows. Year on year this annual loss of condition really takes its toll. But our males are mostly castrated as 3 year olds, meaning they take no part in the rutting season and remain fat right into, and in an easy winter, right through to the spring. So I don’t really know what their excuse is, but there is certainly a noticeable difference in the average age of our males and females! After Dave and I’s conversation, we’ve come to the conclusion that it may be more realistic to state 12-14 as the average age for a female reindeer, but perhaps more like 10 -12 for a male. Maybe we’ll settle for 12 overall to cover all bases. It’s worth noting that some reindeer in permanent captivity may have longer lifespans as they have very little environmental stresses on their bodies, with food provided all year around and shelter from the elements. 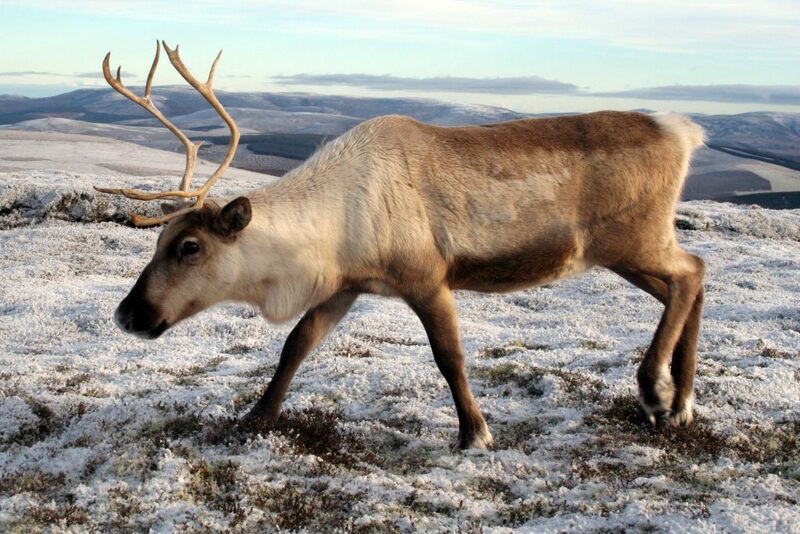 A reindeer named Valeska reached 21 at the Highland Wildlife Park, just 10 miles down the road from us. Valeska was actually owned by us, back in the day when we used to very occasionally send reindeer from our herd to live elsewhere. We’re talking 30+ years ago though, and don’t do this anymore. 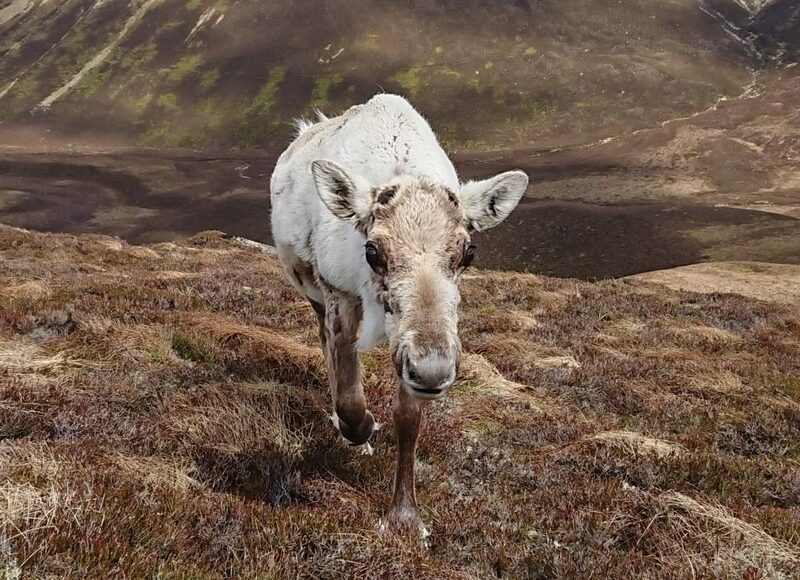 The harsh fact is that the vast majority of captive reindeer, however, in fact have much, much shorter lifespans brought about by incorrect diet, climate and lifestyle, but that’s another matter entirely and beside the point for this blog. 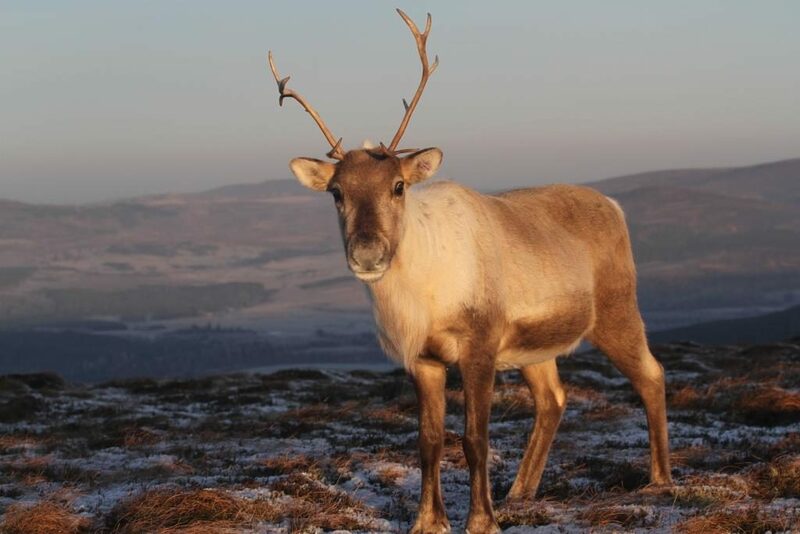 Our reindeer, while pampered to some extent, do live as natural a lifestyle as we can possibly provide for much of the year, and have to cope with the rigours of life in a sub-arctic habitat and climate – the Cairngorms in the grip of a winter storm is not a friendly environment to any animal. 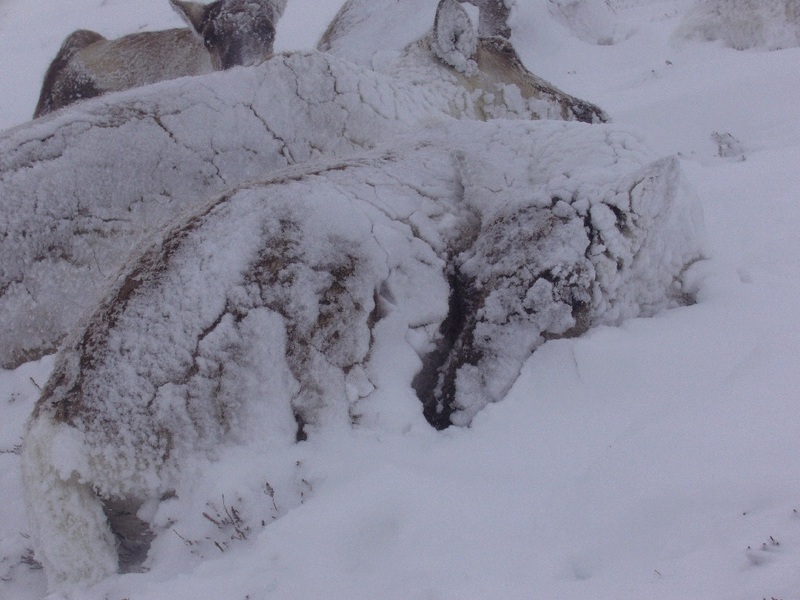 Staying alive in -30°C in howling winds when your grazing is concealed under hard-packed snow and ice, for days at a time, obviously uses a lot of precious energy and vital body reserves. Tuna, one of the herd record holders until 2018! Picture by P. Harris. 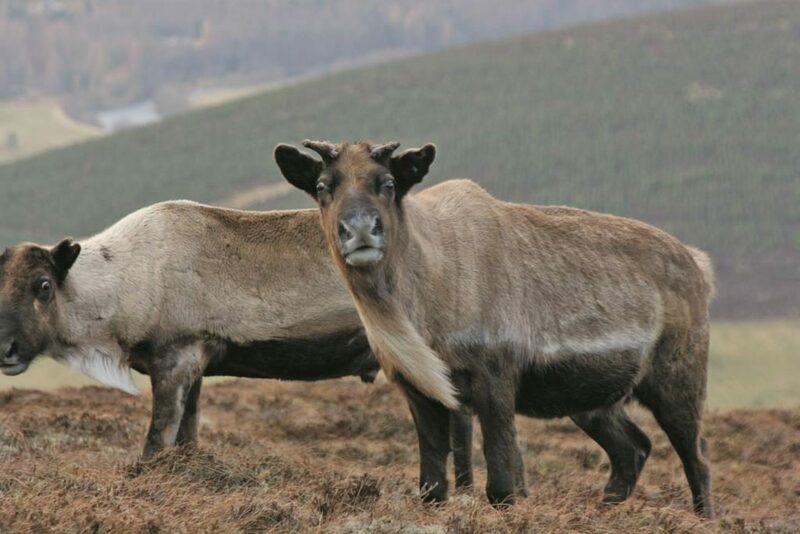 Until last year, 18 was the record age in our herd here for any reindeer, achieved by females Trout and Tuna in 2002. The oldest male was Scapa, who got to 17. But Trout and Tuna’s record was finally beaten last year by Lilac, who certainly reached 19. We last saw her a week after her birthday, still looking great out free-ranging a couple of miles away, but we don’t know the exact date of her passing. An early retirement from motherhood (Monopoly was her final calf, at age 12) no doubt added to her longevity, as did her sheer bloody-mindedness! Lilac lived her life exactly as she wanted, and quite often where she wanted too – which was not always in concurrence with us. Her backside, disappearing over the nearest horizon in the opposite direction from the rest of the herd, became a common sight over the years. Lilac, aged 19 and one week. Free-ranging until the very end! So, who are the geriatric members of the herd today? The oldest of all is actually a male, one of our 2004 import of Swedes, Addjá, who is nearly 17, and has always had a squint nose. Most of you will be more familiar with Boris, our squinty nosed 6 year old, but Addjá was the original ‘ugly’ reindeer in the herd. Hot on his heels are Cailin and Fonn: females who are approaching 16 (Fonn being the older by two days), and then there are females Malawi (13); Lulu, Santana, Joni, Blondie, Enya and Dixie (all 12), and male Elvis (12). Age isn’t everything though, and reindeer have such varying characters than some can go on for donkey’s years without ever seeming to really make themselves known (looking at you, Joni), while others make a huge impact even before they’ve reached a year old (stand up and take a bow, Dr Seuss…!). But perhaps that’s the beauty of working on a daily basis with a herd of 150 animals. And Cailin too, with her distinctive ‘punk’ tuft of white hair between her antlers!